Unlock the burial chamber of the Tongue Chieftain Kvenel. Immediately inside the entrance to your left is a skeleton sitting on a throne that will come alive and attack you if given the chance. After killing him, look down to find Heddic's Volunruud Notes and what appears to be Heddic's skeleton. Reading the book begins the quest, as does attempting to open the puzzle door further on. The next room is a hub chamber with 4 passages radiating off in different directions. The northern passage, up a short flight of stairs, leads to the puzzle door and the final chamber. However, you will need to collect two ceremonial weapons, an axe and a sword, before heading for the puzzle door. Head through the southwest passage to find a chest and some loot. There's nothing else here (unless you are on the quest The Silence Has Been Broken), so head back to the hub chamber. Move through the northwest door. The first and second bends have undead sleeping in the walls, and there are two more waiting around the next corner. 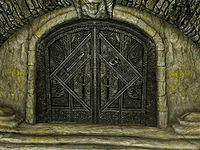 Continue down through the cave and through the next set of iron doors to find the next objective, guarded by an undead boss with one or two draugr to help him. Take them out while being careful of the floor traps scattered between them and you. The ceremonial axe you need is on a display plaque on the wall above and behind the throne. There is also the One-handed skill book Mace Etiquette to the right, on the arm of the throne. Now, head back to the hub chamber. Go through the northeast passage. The first room has two levels and a high bridge above it all. There will be several more undead waiting for you on the balcony across from the one you are on when you enter the room. Kill the ones you can see across from you with a bow or ranged spells, then head down the log ramp and past the swinging spike trap. At the next fork, the northerly passage on your left leads to the balcony across from the one where you entered the last room, so if you wish to loot the draugr you range-killed as you entered, this is the best time to do so. Return to the fork and take the southeasterly branch, which spirals up to the high bridge you saw in the first room along this branch. Immediately after crossing the high bridge, you will arrive at a small chamber with a little altar amid numerous candles. Enter cautiously because there is an undead awaiting your arrival, out of your line of sight in a wall-crypt to your immediate right as you enter. Continue through the iron door and to your second objective, the ceremonial sword. As you approach the central coffin, two undeads will pop out of the wall-crypts flanking you and attack. After defeating them, take the ceremonial sword from the skeleton in the central coffin and head back the way you came, to the hub chamber. Now, with both ceremonial weapons in your inventory, head up the short flight of stairs into the northern passage and activate the iron doors to Elder's Cairn. The two ceremonial weapons will be removed from your inventory and be placed into their respective receptacles in the doors. Activate the doors again to enter Elder's Cairn. A short distance down this path is a small area with a burnt corpse and some minor loot. Just beyond that is a draugr guarding a large spider web, and then the final chamber, which contains The Tongue Chieftain Kvenel himself, along with an undead conjurer. Kvenel is a bluish, ghostly form seated on a throne on the far side of the room, and his conjurer is a draugr to the right (southwest) of Kvenel. The easiest way to defeat Kvenel and his minion (if you have decent Archery skills and enchantments, a powerful bow or crossbow and the Deadly Aim perk from the Sneak skill tree) is to sneak carefully into the room until you have a clear shot at Kvenel as he sits on his throne and shoot him dead with a triple-damage sneak shot with your bow. If your first shot doesn't kill him, you should have time for a second shot as he tries to rise from his throne. Meanwhile, instead of summoning an atronach or attacking you, his conjurer minion conveniently comes over to stand in front of the throne to see what is troubling the now-dead Kvenel, so you won't even have to re-aim your bow to take out the minion. If you are not able, or inclined, to take out Kvenel and his minion from the entrance of the chamber, you will have a semi-difficult fight on your hands. Kvenel himself uses two ice-enchanted melee weapons, while his conjurer minion is a draugr who summons atronachs and casts ranged frost spells to slow you down. Because he casts ranged ice and frost spells and summons atronachs, it is advisable to take out the conjurer first. Alternatively, you could try to draw Kvenel into another room to kill him first, then go back to the throne room to handle the conjurer. The conjurer will summon a Frost Atronach when he sees you. He also uses ice magic to slow you down, making running away or closing the initial gap difficult for melee fighters. You can use the pillars on the northeastern side of the chamber (your left as you enter) to your advantage by using them to block the ice spells as well as blocking his line of sight and regaining stealth. For melee characters, Whirlwind Sprint and plenty of stamina are helpful. Once the conjurer is dead, Kvenel is relatively simple to defeat using any attacks you like and dodging to stay out of his melee range whenever possible. Blocking is also helpful here. Among his ghostly remains is his enchanted sword, Eduj. Due to a bug, you may have to activate his remains again to obtain Okin, the enchanted axe. If it is not listed as loot on his corpse, you may also be able to find it on the ground near his remains. To the right of the throne is a chest with leveled loot and around the stone platform are various potions. Exit the room through the southwest passage where you will find a word wall with a word of the Aura Whisper shout. Up the stairs will be the bridge you passed under on your way into the boss chamber along with any draugr you didn't snipe on your way in. Across the bridge, you will find a final chest of leveled loot along with a Dragon Priest Dagger and a reference book about Labyrinthian on the floor. As you return to the bridge, look to your hard right to find a chest on a ledge in the shadows. You can reach it by jumping to the tree roots and then jumping again over to the chest, or by using Whirlwind Sprint. Drop down and head south to find the exit. The swinging spiked door may be sprung by draugr and then not reset, making the rest of the northeast branch inaccessible. ? Sometimes the ceremonial weapons are unable to be picked up. ? Reloading a past save should fix this. You can open the console, click the weapon, and then type moveto player. That should place the weapon at your feet and you should be able to pick it up. Putting in the sword first, then getting the axe and putting it in, may make the door inoperable. If you have the ceremonial weapons on you, the door might not take the weapons, making the rest of the quest and the word wall inaccessible. This may occur if you pick up one of the weapons before starting the quest. ? Drop the weapon(s) and then activate the door to start the quest and it should take the weapons. Sometimes, reading Heddic's Volunruud Notes will not give you the quest. This may lead to the door not activating the quest either, making the quest inaccessible and the door unable to be opened, even with both ceremonial weapons in your inventory. To activate the quest line, drop it and all ceremonial weapons from your inventory, then activate the sealed door. To activate the quest line, drop both ceremonial weapons and the journal, exit Volunruud, re-enter then read the journal again. Use the console command coc Volunruud02 to get past the door. Alternatively, use the console command tcl to clip through the door and activate it from behind (it's a normal door), which moves you to Elder Cairn. Don't forget to switch tcl off afterwards. Don't kill Kvenel while he is sitting on his throne. You can get Eduj, but when you activate his remains again to obtain Okin, it won't be there. Reloading a previous save to re-kill Kvenel off his throne solves the problem. ? You can kill Kvenel while he is sitting and still get both weapons if you pickpocket Okin first. Eduj is still lootable from his remains. 10 I may be able to recover two ceremonial weapons within Volunruud which will allow me to enter the Elder's Cairn. 13 I've found the ceremonial axe in Volunruud. 14 I've found the ceremonial Sword in Volunruud. 20 Now that I have both ceremonial weapons, I should be able to open the door to the Elder's Cairn. 100 Finishes quest I defeated an ancient draugr named Kvenel within Volunruud. On the PC, it is possible to use the console to advance through the quest by entering setstage dunVolunruudQST stage, where stage is the number of the stage you wish to complete. It is not possible to un-complete (i.e. go back) quest stages, but it is possible to clear all stages of the quest using resetquest dunVolunruudQST. This page was last modified on 26 September 2018, at 13:35.